I could sit here and wax poetic about how much I love the latest spring trends... But I won't bore you with that. Like I have mentioned before, orange lipstick is the lip color of the moment, and it doesn't look like it is going anywhere. Navy blue eyeliner is also all the rage this spring (click here for a navy blue winged eyeliner tutorial- perfect for hooded eyes (and all eye shapes in general)!). I've also noticed that a lot of brands have been adding some sort of rose element to their products, such as rosehip oil or rosewater. I am not complaining about that one. And, as always, radiant skin is the way to go this spring. I included both high-end and drugstore products, so there is something for every budget here. 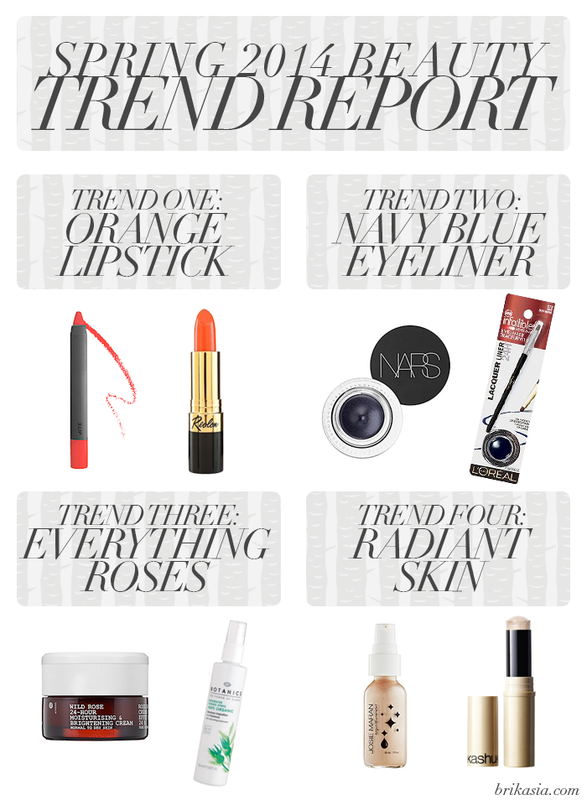 There are several other major trends this spring that I didn't touch on- but these four are definitely my favorite. What are you favorite trends that you've spotted this spring? Agreed- fuchsia lips are THE BOMB.